Leaving tomorrow morning for Sudbury where I’m combining a visit with family with another Brian Henry workshop. Promises to be great fun, relaxing and informative… that’s the whole weekend, not just the workshop. This workshop is on Writing and Revising and with where I am in Sarah’s Gift, I need this workshop sooner than later. Although it is being offered in Kingston in October (if my memory doesn’t fail me). And I will likely attend it again. There are always things you miss on the first go around. I can’t say I’ve ever had this happen before but it has now. I’ve had my feet propositioned! I’d bought a new outfit to wear to a birthday party on the weekend. I was wearing chunky turquoise jewellery – necklace, bracelet, ring. Later in the supermarket, I came across a bottle of nail varnish that would be the perfect match for my accessories. 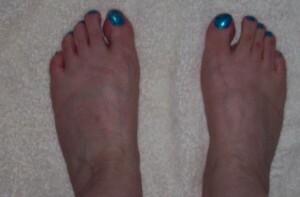 So, I painted my toenails to match. Little did I know what was to happen later in the afternoon. So, only having worn the sandals for a short time to get used to them and with having to climb steps, I decided going barefoot was the way to go. After all, I didn’t want to “fall off my shoes”. One of the guests, looked down at my toe nails and that’s when the fun began! He started by saying that they looked absolutely delicious! I think he said, he could eat them up, too, but that he didn’t have a fetish. And in the next breath, he said he was salivating! The more he tried to get his foot out of his mouth, the deeper it went in and the other one joined it soon afterwards. I looked at one of the other guests – my bikerhen friend – and we got into the laughing. We laughed so hard I almost peed my pants. Even he who propositioned my feet had a good laugh. When the party started to break up, I put my shoes back on and went in search of “he who propositoned my bare feet”. If he thought they looked good out of the shoes, what did he think in them? Here is a picture of the shoes… what do you think? I’ve come to the conclusion is very much like the road to hell… paved with good intentions. But, I’ve gone further than many people along that road. I’ve had a number of non-fiction articles published, and two complete novel manuscripts. And I have sent out queries, pitched to editors, unfortunately, all with the same results. However, since joining RWA and the Ottawa Romance Writers Association (chapter of RWA), my writing has improved ten-fold, if not more. Workshops, support and mentoring have gone a long way to aid my quest in becoming a published author in novel-length fiction.